When I complete a project, I always have a sense of satisfaction. Sometimes I’m happier with the outcome than others. And, I’ve had my share of DIY disasters over the years – most of which you won’t find here! Today was one of those days that I was giddy with happiness when I put the final brush stroke of paint on this DIY farmhouse tabletop that Mark built and I finished. I’ve wanted a larger table for a while, but really loved the base of our existing trestle table. I purchased this table for $40 at a yard sale. You can read about it here. I’ve had the “idea” of building a farmhouse tabletop to attach to the base of our table, but I sometimes have a hard time explaining my “ideas” to my husband – the builder! There are times I have an idea and I go on and on telling him all about it, and he just stares at me blankly! That’s where visual aids come in handy. So, here’s the visual aid I showed Mark to explain my vision. 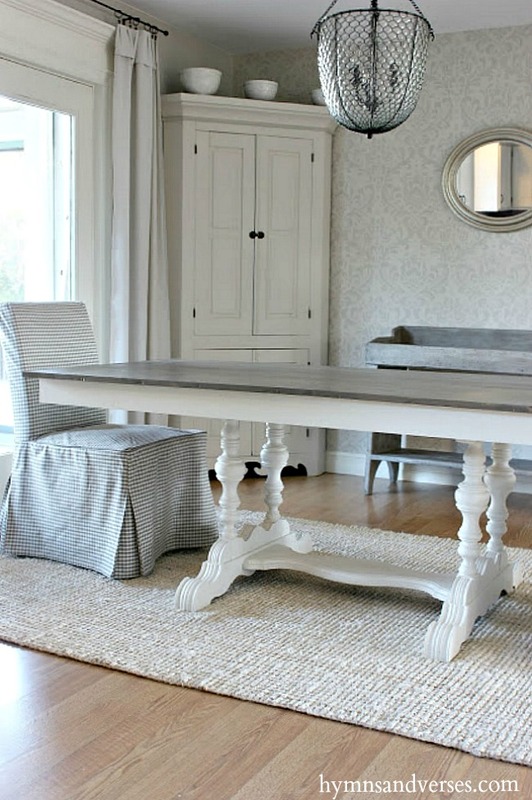 The photo above is the Baroque Parquet rectangular table from Restoration Hardware (no longer available). It’s a very grand table and would never fit in my house, but it’s the look of that style tabletop on our trestle table base that I was going for. For the table top, we used four 1″ x 12″ pine boards cut to 6 feet long and a 1″ x 6″ board cut to size running horizontally at each end to create the 7 ft. long table top. Then Mark made a skirt using 1″ x 3″ pine boards. The entire table was put together with pocket holes and screws using a Kreg Jig and it’s solid. The finished skirt fits snuggly over the existing trestle base. Once Mark had the table top assembled, I sanded the entire piece to make sure there were no rough edges. Then I used a mixture of Rustoleum Weathered Gray and Minwax Dark Walnut stains for the table top. Once the stain had cured, I applied two coats of Varathane Triple Thick Polyurethane. 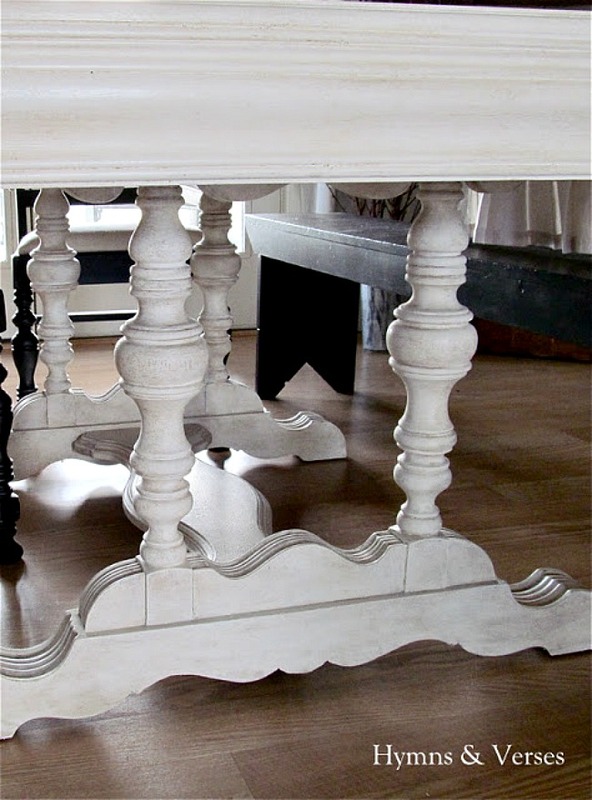 I gave the table base a fresh coat of white paint – Maison Blanche Magnolia. So, what do you think of our new farmhouse tabletop? 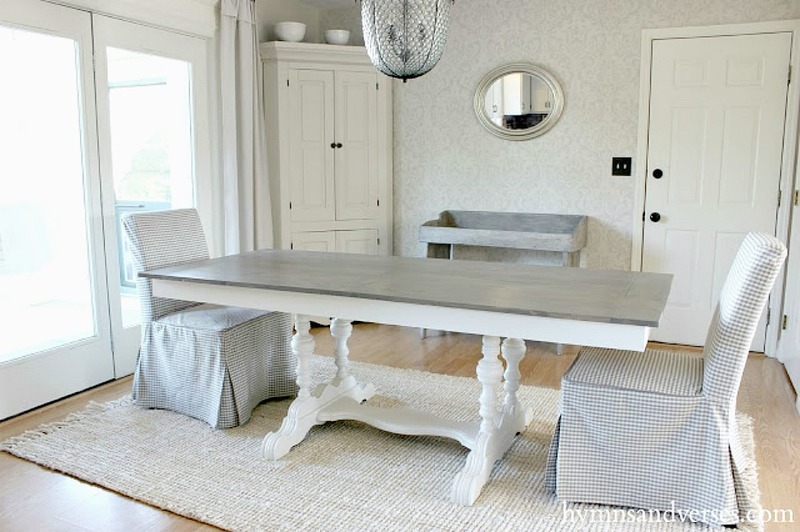 If you are looking for good tutorials and plans for building your own farmhouse table or table top, there are a few sources that I can recommend: Ana White and Shanty 2 Chic. These amazing ladies really know their way around a workshop and have building plans that are easy to follow. Oh, Doreen, I can see why you are giddy! Your table is absolutely beautiful! Congratulations to you and Mark – what a team! 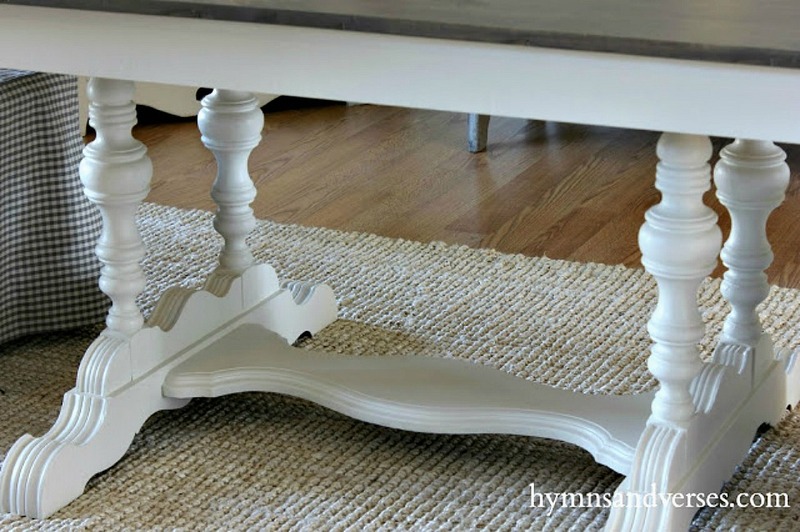 What a god looking table…luv it! Is there a top coat on the table – like shellac or polyurethane? Is it shiny. If so, I don't think the oil would be able to sink into the surface of the wood. If it is just the old wood, then the oil would be perfect! Love it!! 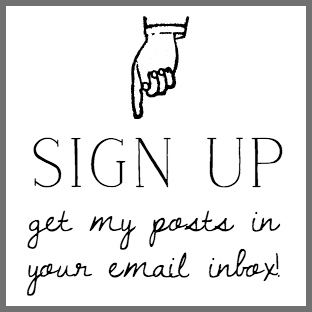 And love your blog – your home is so beautiful and inspires me in my new home!! 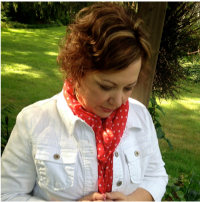 Along with my new home I started a blog recently….perhaps you can visit me? It looks awesome….just like your blog!!! Thanks for sharing. Oh my, Doreen, this is just beautiful! I would want to show the world if I ever made anything this beautiful! :) Nicely done and thanks for sharing! Your table is fabulous! I have to thank you also because I followed one of your links and that person gave a detailed list of all the tools I needed to buy to start…anyway it was exactly what I needed so thank you. The table looks fabulous!!!! I love the light fixture also..Did you make it? 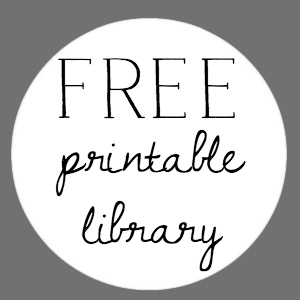 The light fixture was purchased at the Pottery Barn Outlet and was a great deal! I don’t think they sell this fixture anymore!